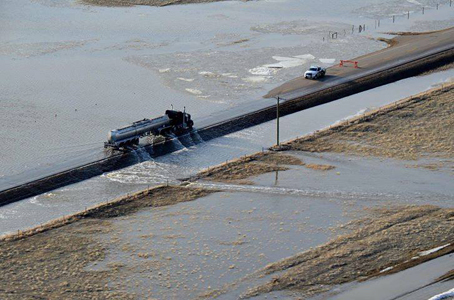 With the continuous threat overland flooding has been presenting to the Municipal District of Taber, it has also had an effect on Horizon School Division. In order to give an update to the Horizon board, members of the M.D. staff were present to go through the process the M.D. has implemented with overland flooding. One of the biggest concerns the M.D. has been dealing with is the closure of roads throughout the region, with many of them impassable or in rough condition due to the surge of water around. This has directly impacted Horizon due to the amount of busing needed in the rural areas and with the roads closed many of the buses have seen some inactivity. “We appreciate your co-operation with road conditions the last few days and with the state of emergency in the M.D., I don’t know if you’ve heard but around us a few more state of emergencies have gone out. County of Lethbridge, County of Forty Mile, Village of Foremost, Siksika Nation and the one here in (the Town of) Taber is expiring today, they aren’t going to renew,” said Brian Schafer, M.D. of Taber fire chief, during Horizon’s board meeting on April 17. The last time the M.D. enacted a local state of emergency was in 2013 after similar events unfolded with melting in the spring, though this year has been particularly bad. More and more roads continue to be closed as well as M.D. staff try to keep citizens off roads that have a potential to pose serious threats. This spring has proven to be an event more severe than in years past which is obvious with the sheer amount of road closures already in place, with more likely to come. “It’s pretty widespread (road closures) because most of the infrastructure that we have is not designed for one in 100-year events. Most of our stuff is based on one in 25 year events so in the case of something this massive, our infrastructure is overwhelmed. Water coming over top of roads, road edges, washed out culverts, we’ve got holes, massive corrosion on the side of road ways and we’ve set up barricades because for the normal travelling public everybody thinks a Smart car is the normal travelling public. If they go down a gravel road they’re going to end up in a ditch or a big hole formed in the road. This is road closures on an extent that I’ve never had to go to but it’s hazardous. People going around them are taking their lives into their hands,” said Jeremy Wickson, director of public works for the M.D. Barricades have been placed along several roads in the M.D. but even though they are in place to prevent people from travelling on that particular road, they say they have been advised of several people ignoring them or moving the barriers to drive through. While the M.D. community peace officers and Taber/Vauxhall RCMP detachment can’t cover each and every road closed, they are out patrolling. If caught moving a barricade, there are severe punishments including demerits and heavy fines for disobeying posted signage. While bus routes have continued to be cancelled or modified with the flooding, schools have remained open. Horizon have had to deal with a few events this school year with large snowfalls, extremely cold weather and now flooding that had cancelled buses or even closed schools based on the weather. The division though sees shutting down schools as the last resort as they realize parents may have a tough time finding supervision for their younger kids. “We don’t shut down schools lightly, we recognize as well that when school’s are shut down there are families out there trying to make a living and they have to make arrangements or take a personal day to take care of their kids. We also know that in circumstances like right now, we’re keeping the schools open but there is a significant reduction of busing so that does put strains on individuals,” said Wilco Tymensen, superintendent of schools for Horizon. Keeping up with what roads have been closed in the M.D. has also been made easy with a new tech staff have been working with. The new program helps inform M.D. residents in real time about which roads are closed through mapping data. “What we’ve been doing through our application is we’ve been tagging wash outs in roads and we live highlight road closures as we go along,” said Wickson. You can find the map program at mdtaber.maps.arcgis.com/apps/webappviewer/index.html?id=43e2fd45eca3446a8402df117be6a024. With the widespread damage across the M.D. rebuilding and repairs will sure to be a focus when things dry out. With the amount of water still on land though, there is no timeline as to when M.D. will be able to access the damage. For information on bus cancellations and updates to the local state of emergency visit horizon.ab.ca and http://www.mdtaber.ab.ca.